For those with outdoor or portable storage sheds, loading small equipment like your lawnmower can be frustrating, time-consuming, and potentially dangerous. The Apex Aluminum Dual Runner Shed Ramps were engineered to reduce the stress involved with loading a riding lawnmower, snow blower, wood chipper, or ATV into your shed or garage. These lightweight yet incredibly durable and strong storage ramps are made from high-strength aluminum. Weighing only 4 pounds each, they can handle a maximum of 750 lbs. per ramp. Since they are sold in pairs and designed to work in tandem, they have a maximum loading capacity of 1,500 lbs. The Apex lightweight ramps are easy to set up and take down and can be hung on the wall for convenient storage. The shed loading ramps feature a full-width, 4”-long pre-drilled attachment plate, which permits owners to secure them to the storage shed’s floor easily (mounting hardware is not included and needs to be purchased separately). The Apex loading ramps include a 3½” rung spacing, which makes loading smaller tire equipment much simpler. The lightweight design allows them to be conveniently hung from a wall. These lightweight ramps measure 3’ long x 8” x 1 ½” high. The Apex Aluminum Dual Runner Shed Ramps include a one-year warranty. We take pride in selling products made from materials that are far superior to what our competitors offer. Our dedicated team of experts is always available to answer any questions regarding our products. We offer high-quality items, fast turnaround times, and incredible customer service. 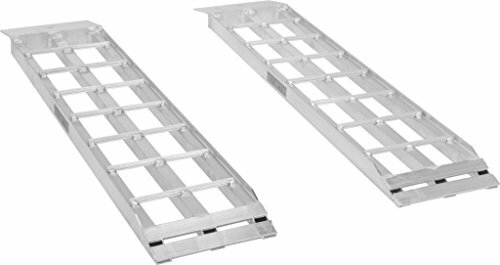 DURABLE, HIGH-STRENGTH ALUMINUM: The Apex Aluminum Dual Runner Shed Ramps are manufactured from lightweight, high-strength aluminum that can handle 750 pounds per ramp. 1,500 LB. TOTAL WEIGHT CAPACITY: These dual-runner shed ramps are sold in pairs and meant to work in tandem to load your lawnmower, wood chipper, and more into a shed or garage. ONLY 4 LBS. PER RAMP: Weighing only 4 pounds each, the Apex garage loading ramps are easy to set up, take down, and hang on the wall for convenient storage. These lightweight ramps measure 3' long x 8" x 1 ½" high. 3½" RUNG SPACING: The Apex shed loading ramps feature a full-width, 4"-long pre-drilled attachment plate, allowing you to secure them to the floor of your shed. The addition of 3½" rung spacing makes loading smaller wheel equipment simple. ONE-YEAR WARRANTY: Apex uses superior materials to our competition. We stand by the quality of our Apex Aluminum Dual Runner Shed Ramps by offering a one-year warranty.